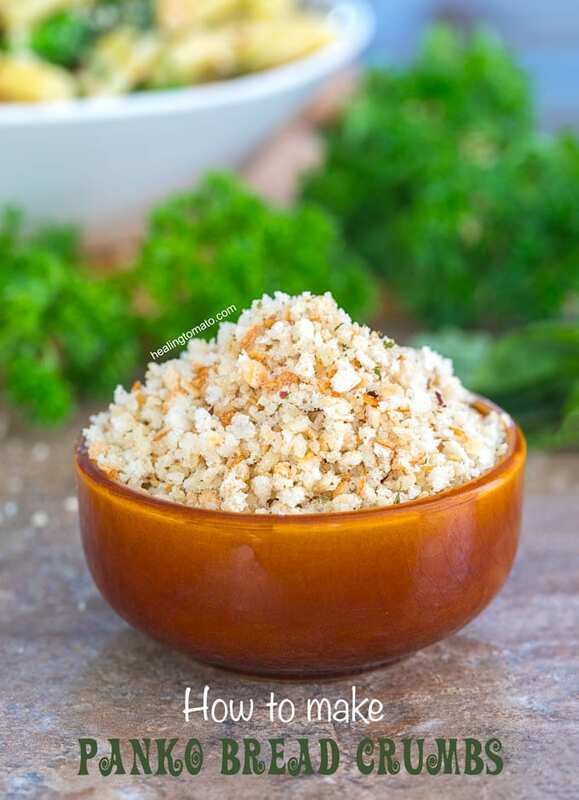 How to make panko bread crumbs from stale bread? 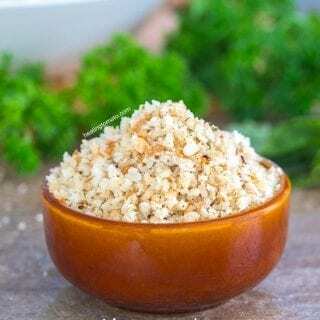 Its very quick and easy to make homemade bread crumbs using day old bread that might be going stale. Its the challenge of making something myself that always inspires me to try. There is nothing wrong with the store bought version of panko bread crumbs. In fact, I buy them all the time. Looks like the stuff you buy from the store, doesn’t it? I bought Ciabatta rolls for the purposes of making my favorite eggplant Parmesan sandwich. Its one of my favorite sandwich recipes and I wanted to see if I could make a vegan version of the sandwich. My good intentions of making this sandwich were no match for the craziness happening in my life. Things were so hectic after I bought the bread that I had to put the sandwich experiment on the back burner! A few days later, I look at the bread and its starting to go stale. How do I define stale bread? Well, for one, it wasn’t soft like the day I bought it. Parts of the bread were hard and the other parts were on their way to being hard. At this point, the bread may not be ideal for sandwiches, but, its perfect for bread crumbs. And, I am so glad I did that because they were the best panko bread crumbs ever made! Plus, they are so easy to make. Takes less than 5 minutes to make them and they can last up to 4 months. So, I am trying something new here. I am going to answer questions that I anticipate you will be asking related to bread crumbs and stale bread. If you have more questions, ask me anytime. 1. What’s the difference between panko and regular bread crumbs? 2. Can Panko breadcrumbs go bad? 3. Can you refrigerate panko breadcrumbs? 4. What’s the best bread to use to make bread crumbs? 5. What can you make with Panko breadcrumbs? 6. How do you make stale bread? 7. What if you don’t have bread on hand? 8. Are Panko breadcrumbs vegan? 9. Can you make bread crumbs without a food processor? 10. What kind of seasoning can you add to bread crumbs? 11. Can I revitalize stale bread? 12. Can you make croutons using stale bagels? 1. What’s the difference between Panko bread crumbs and breadcrumbs? The texture is the first difference you will notice. Regular breadcrumbs are finely ground wheareas Panko is roughly ground. 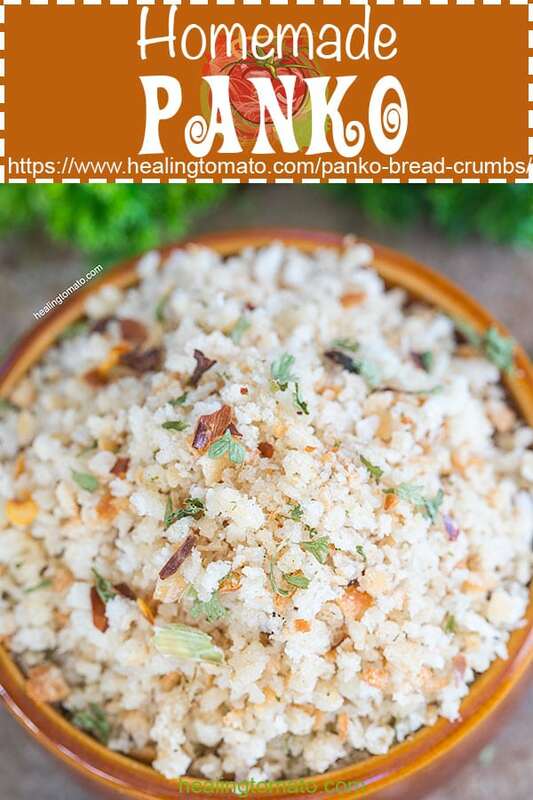 The panko crumbs are flakier and is almost always made with white bread. Regular breadcrumbs can be made from any type of bread. Panko bread crumbs have been used in mostly Asian cooking. However, many western chefs have started using it in their daily cooking because it adds so much texture to a recipe. 2. Can Panko bread crumbs go bad? The store bought versions can last a very long time, as long as you don’t expose them to air. I keep them in their container which is tightly sealed. For the bread crumbs I make at home, I try to use them up in a week or two. Since they are fresh and have no preservatives, they tend to have a shorter shelf life. 3. Can you refrigerate panko bread crumbs? Yes! When I make them at home, I always transfer them in these (affiliate link) air tight containers and refrigerate. This way, they remain fresh and last up to 6 months. You can do the same with regular bread crumbs. White bread is always used to make panko bread crumbs. I used ciabatta bread to make it, but, you can also use Italian or french bread. The key is to make sure the bread is stale so that it grinds up easily. Sadly, fresh bread doesn’t grind into powder texture. 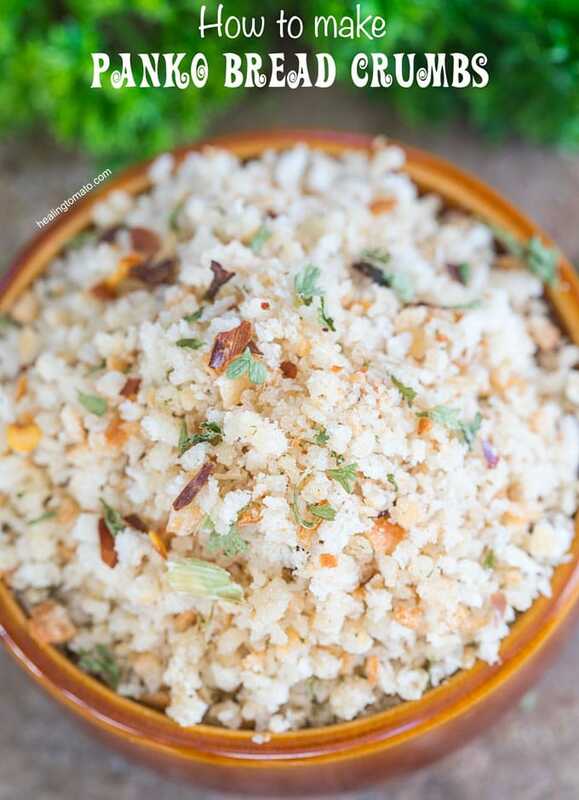 For regular breadcrumbs, you can use any bread you have lying around. I find that whole wheat bread makes for really finely textured bread crumbs. One thing I learned was that Brioche bread doesn’t make good breadcrumbs. But, you can still use it in a dessert like this limoncello recipe by Seduction in the kitchen (has eggs)! 5. What can you make with Panko bread crumbs? That’s the best part, because, the sky is the limit! Panko can be used in so many wonderful recipes that you will never get bored of experimenting. 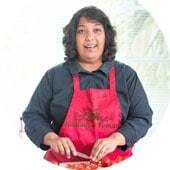 They are great for stuffing recipes, pasta recipes, dessert recipes, appetizers and even a few desserts. My favorite panko recipe to make are these spicy fried grit balls and for making these sweet potato wedges. They were also perfect for my veggie meatball sub recipe. Stay tuned because I am going to be using them in a delicious casarecce pasta recipe where they take the place of Parmesan cheese. 6. How do you make stale bread quickly? If you don’t have stale bread on hand, but, find an urgent need for it then there is a perfect way to make them. Place regular bread in the oven at about 350° for about 5 minutes or until its hard. Make sure its not browned. Then, place it in a blender and grind it until its has panko texture. Ok, that’s a tougher question to answer. There are a few panko substitutes I have seen. I have seen bloggers make it with saltine crackers or even melba toast. Personally, I haven’t tried it, so, I can’t speak to it. I have actually attempted to make them using biscotti and had mixed results. 8. Are Panko bread crumbs vegan? Well, it comes down to the type of bread you use. Most white breads are vegan, so, you should be ok. I have seen some vegan ciabatta bread where eggs are not used, so, you can make it that way. I saw a quick vegan ciabatta recipe by holycowvegan.com that looks delicious! Yes!! Isn’t that good news? I find that I have become to reliant on the food processor, so, I try to find other ways to grind stuff. Take stale bread and place it in a ziplock bag. 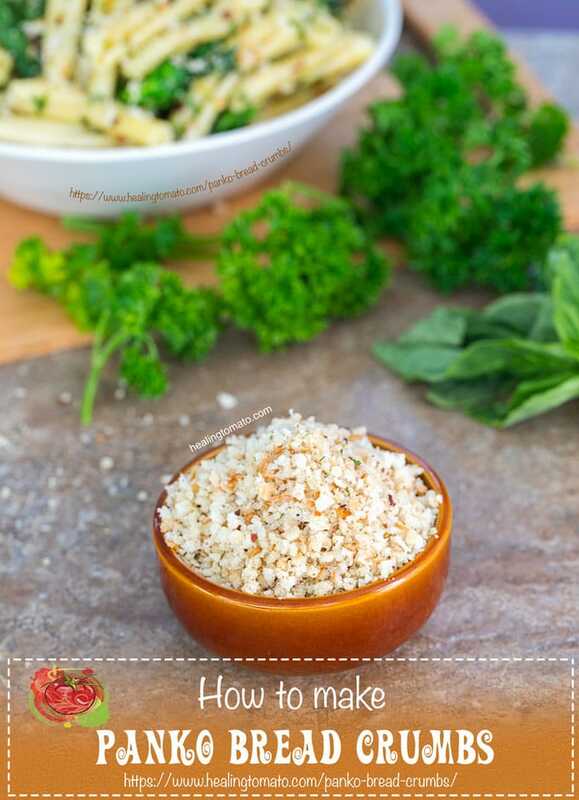 Then, using a rolling pin or even a tenderizer, grind it to panko texture. You might not get a fine texture like with a food processor, but, you will come really close to it. You might need to roast your bread for a little longer to make it harder and thus, easier to crush. 10. 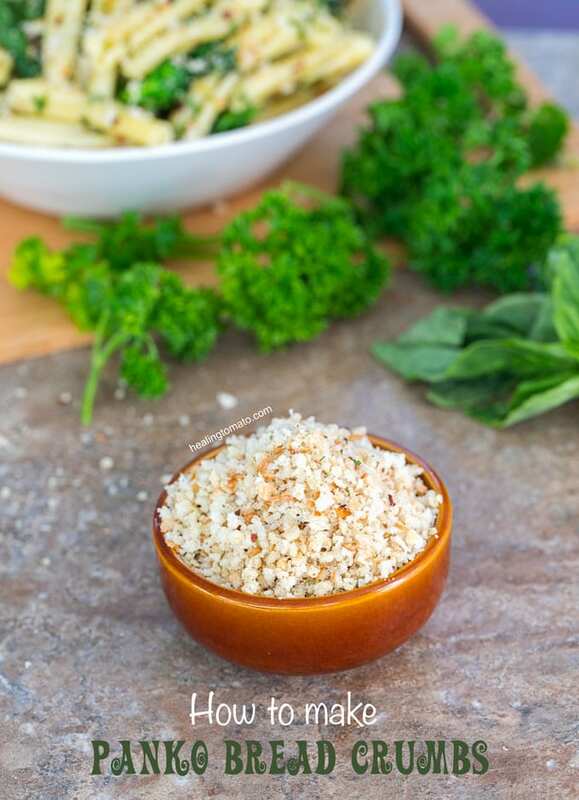 What kind of seasoning can you add to Panko bread crumbs? Once again, the sky is the limit! Don’t you just love hearing that? I like adding all kinds of spices to it. If I am using it in an Italian recipe, I will add italian seasonings in it. For Greek recipes, I love adding parsley and dill. Yesterday, I experimented with adding Za’tar and it made the bread crumb taste exotically delicious. 11. Can I refresh stale bread? Sometimes, you paid so much for bread and it goes stale quicker than you can use it! I hear you. That happens to me so often. Its too much bread to turn into bread crumbs. So, what do you do? Wet the bread by putting it under tap water. Then place it in the oven at “keep warm” or a very low temperature (about 150°). Let the water dry out and the bread will be good as new! This revitalized bread will be perfect for my bread salad recipe. Yes and no! I realize that its a confusing answer. The best bagels that make croutons are the plain bagels and the everything bagels. I tried with the blueberry bagels and they didn’t turn out so well because technically, blueberries don’t go stale. So, the result was a slightly soggy mess. The bread crumbs from the everything bagels was my favorite. Use a bagel that doesn’t have any soft ingredients like blueberries, cranberries, raisins, etc. What’s your favorite Panko recipe? If your bread is not stale or stale enough, preheat oven to 360°. Place the bread in it and roast until its hard but not browned. Remove and cool it before grinding. I always have leftover baguettes because Connor won’t eat the last sandwich knowing I am going to make these Panko crumbs for topping his mac and cheese! I use panko bread crumbs ALL THE TIME!!! Can’t wait to make my own! GREAT IDEA!!! Who knew you could make your own Panko?? I sure didn’t!! Brilliant! I save all the heals and little bits of bread in the freezer for just something special like this! Though, honestly, I’ve never even tried making my own Panko. I’ve made stuffing and croutons. But now I need to try panko! We are never quick to eat bread when we have it in the house, so this is going to save me some money by transforming the bread into panko bread crumbs. So simple and economical! Does panko freeze well? I am the same, I hate throwing food away. It’s just to expensive to toss! Bread to breadcrumbs or croutons, I’m right there with you! What a great idea! I have never tried to make panko – but now I really should! Thank you for answering all my questions regarding Panko. I agree with you, homemade is always so much better! I’ve made bread crumbs and croutons with my stale bread but never thought to make panko which I love! Thank you for a wonderful tutorial and recipe!